I love seasonal foraging and nothing is more seasonal than tapping silver birch sap. As early spring arrives, the trees wake, stretch their limbs and draw water from the ground up to the waiting buds. You have two weeks, three at the most, to catch this sap, this spring tonic, before nature moves on and the window has passed. Last week, armed with a drill, a bit of metal pipe and an old tin camping kettle, my friend and I headed into the woods at dusk to set our taps. We chose a large tree, well away from the path, and bored a small hole. The liquid started to gather in the fresh wound straight away, dripping onto the mossy forest floor. I stuck one end of the pipe into the hole and the other into the spout of the kettle and the drips turned to a steady clatter. I’d imagined a badger bumbling into our rickety set-up during the night, but when we returned the next evening all was well. The kettle was full to the brim. We bunged the holes with corks and toasted our success with a sip of sap. It wasn’t the sticky liqueur of my imaginings. It was cool and refreshing; water with just an afterthought of wood and a hint of milk. Half a glass made me feel like I could live forever. Back home, I made a syrup by boiling the sap, reducing it and adding sugar. It was tasty drizzled over crisp bacon and French toast on Sunday morning. On a roll, I set some more taps the next day. I needed, afterall, a gallon of the stuff for my wine. When I returned a few days later, just an inch or so of pale liquid twinkled in the bottom of the jar. The sap, it seems, had been and gone. Still, foraging, for me at least, is never about the result. It’s about where it takes you, what it shows you and how it connects you with nature. It would, of course, have been much simpler to buy a bottle of Sauvignon Blanc from Tesco than attempt birch sap wine. But I wouldn’t have stood in the evening woods feeling the trees drink from the earth or have quenched my own thirst with a shot of spring. Foraging is also about patience and my birch sap wine will have to wait for another year. Apparently, a birch tree can spare about a gallon of sap in the spring without coming to any harm, but you need to plug the hole afterwards. I used a wine cork to plug the first holes (but, on reflection, I think these holes were too big). I whittled a wooden plug for the second, smaller holes. You need to drill your hole to just beyond the inside of the bark as this is where the sap rises. The tube should incline slightly downwards to allow the sap to run easily. You also need to sterilise your tube before you stick it in the tree. 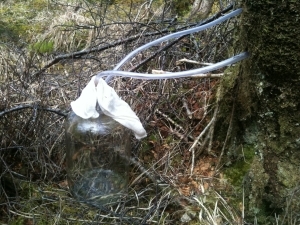 I filtered the collected sap through a jelly bag to get rid of the odd beastie or two. I left my tapping a bit late. Birch sap rises in March, normally in the first two weeks. As well as syrup and wine, you can also make birch sap and mint ice cubes. They go nicely with a single malt.